Southern California is known for freedom, adventure, and around-the-year warm temperatures. 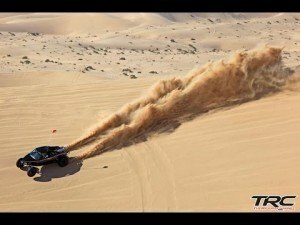 But, the Glamis Sand Dunes in the area are giving rise to a new claim, absolute, horsepower-defined freedom. Most think of the desert as stale, dry, and boring. Horsepower Wars, an event held on New Year’s Day, is forcing people to reimagine sweat and excitement in the desert. What the H-E-Double Hockey Sticks Is THAT? – We’ve showcased amazing off-road vehicles before but this dune buggy was something so sinister we just had to tell you more about it. What happens when a twin-turbo, Chevy engine is mounted behind an aluminum body and chromoly roll cage? The fastest thing on wheels takes to the sands with more gumption than the Bugatti Veyron could have dreamed. 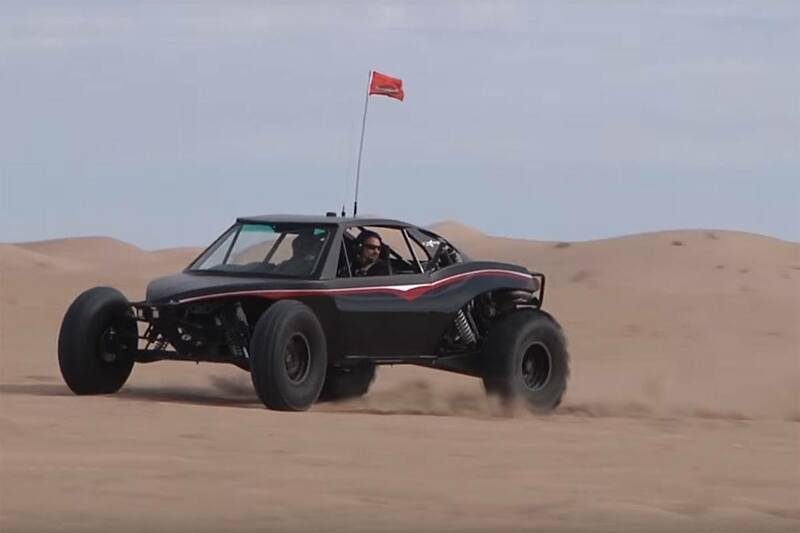 At more than 1,600 horsepower, this Goliath of Innovation dares to break the previous records, usually around 200–500 HP, for the most horsepower to tear up the gleaming sands of Southern California. As the THING roars across the dunes, the amount of sand could blackout sunlight for the driver and passengers, making the excitement all the more worthwhile. Plus, the oversized tires and sleek design team up outperform the driver’s expectations. In fact, who would want to drive this THING? Who’s Caught in the Inside? – Those who love off-road racing are not surprised to hear of BJ Baldwin at this type of event, you can clearly see Baldwin’s perilous gaze as the monster dune buggy exudes power, prowess, and anger. Even if Baldwin wanted to get out, this titan wouldn’t allow it. This behemoth takes no prisoners, offers no mercy, and provides no sense of survivorship, but the horsepower-drunk, adrenaline junkies see no problems here. It’s simply part of the journey for those with an unyielding determination to take power by the steering column, and BJ Baldwin is just the man to do it. What Could This THING Possibly Be Worth? – How do you put a price tag on the cost of freedom, true power, and mutual force? You don’t. You simply look at the Colossus of Dunes with admiration, fear, and joy combined. At a cost of $170,000, this THING costs a pretty penny, but don’t you get what you pay for? Absolutely! Sure, there are plenty of dune buggies that cost lots less, and some boast an impressive horsepower and excitement-driving freedom. You could go out and find one of the cheaper ones and still rip up the sands with the passion of BJ Baldwin, but something would be missing. Something would be out of place; this THING has no comparison. It would be like comparing a Toyota Avalon to a Lamborghini. Is it worth the $170,000? $170,000 can buy a lot of things, but if I had it to spend, I wouldn’t think twice. The horsepower-to-dollar ratio makes typical dune buggies look like dog sleds. Affectionately termed the “2-Seat Death-Sled,” this Leviathan of Dunes is not for the faint of heart, nor does it offer any hope in crawling out without realizing one’s own mortality.This THING makes roads unnecessary and challenges nature to a direct contest of right of ownership of the Glamis Sand Dunes. Imagine rocket-powered performance in the ultimate sandbox. Can you feel the power of what Baldwin felt? I thought so. Let’s just say this buggy is going to be back out soon, redefining the relationship between dune and man.